Yesterday evening starting at 6pm, MassDOT, along with the Boston Redevelopment Authority, held its fifth and final public meeting at the State Transportation building, where it unveiled the final guidelines and Invitation to Bid on Parcels 25 and 26. The Chinatown community has dedicated countless hours attending all five meetings and submitting oral and written comments during and after each meeting. The Chinatown community has patiently followed along with MassDOT’s public process, repeating the community’s needs time and time again. MassDOT has failed to respond in good faith and as a result the Chinatown community felt it had exhausted its options and was compelled to walk out en masse. A community meeting about public land parcels on Kneeland Street took place June 7 at the Transportation Building. The site includes the Reggie Wong Memorial Park, the Massachusetts Department of Transportation (MassDOT) District 6 Office at 185 Kneeland Street and the Veolia Energy steam power plant at 165 Kneeland Street. The meeting was the fourth community meeting to present MassDOT guidelines and the Invitation to Bid (ITB) for potential redevelopment of MassDOT Parcel 25 and Parcel 26, respectively the district office and steam power plant. Reggie Wong Memorial Park is one of Chinatown’s few open spaces. It hosts nine-man volleyball tournaments regularly, a street sport developed by Chinese immigrants with roots in Toishan. A traveling tournament was formed in the 1930s. Local teams today include the Chinese Freemasons, the Boston Knights and the Boston Hurricanes. Volleyball games are a summertime staple at Reggie Wong Park in Chinatown. The park and the surrounding block are being sold by the state to developers. They come a couple of evenings a week every summer, teenagers from Brighton, Malden, Quincy, and nearby Chinatown, to a volleyball court at the foot of an old steam plant by the Southeast Expressway. They come to learn a sport that’s been native to this neighborhood for decades: Nine-man volleyball, a city version of the beach game created by restaurant workers in the 1930s and still played in Chinatowns up and down the East Coast, by new immigrants and established club teams such as the Boston Knights and the Chinese Freemasons. But this summer, the future of the game’s home turf in Boston is cloudy. 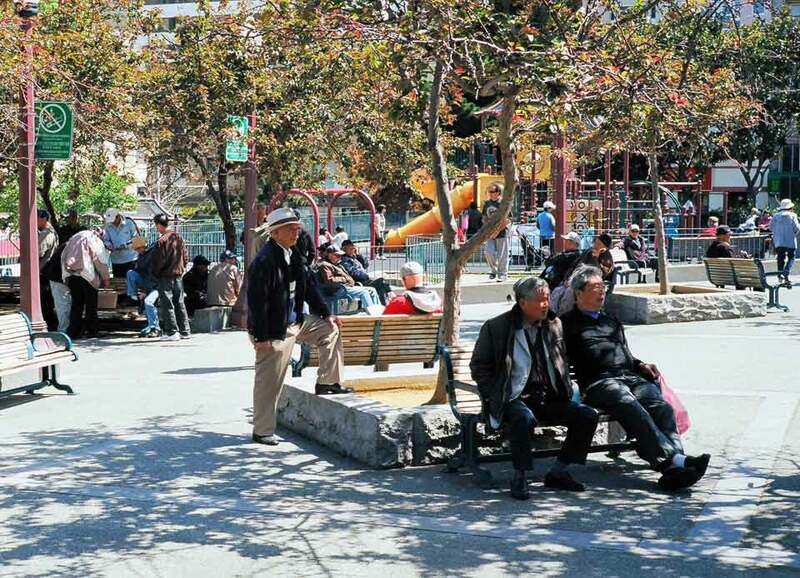 Originally called the Plaza, and now known as the “Heart of Chinatown,” the city’s oldest public square harkens back to the days of Yerba Buena, the small coastal settlement that became San Francisco. Portsmouth Square bears very little resemblance to its past, but the plaza is a significant historic and cultural space that continues to function as a focal point for community gatherings.